“Time spent with cats is never wasted!” – Sigmund Freud. This quote finds new meaning when you step into Cat Heaven in Somerset West, a Cat Gift Shop and Rescue Cat Café – the first of its kind in South Africa. Local resident and retired academic, Valerie Steinmann, spent the best part of the last 20 years travelling the world and it was in Thun, Switzerland that she came across “a true cat lover’s shop”. Totally enchanted by her discovery, Valerie’s passion for ‘all things cat’ was ignited and thus began her cat crusade, collecting unique cat gifts from around the globe. 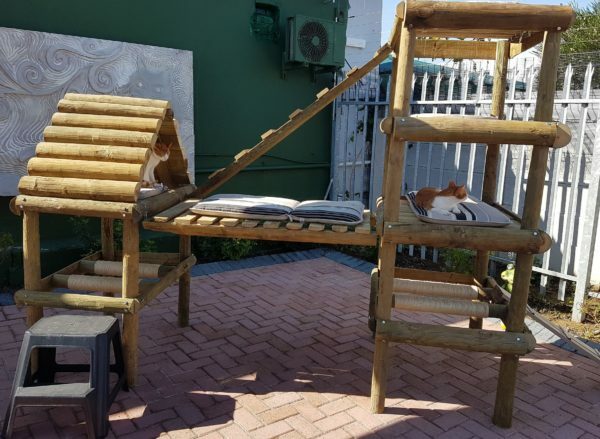 To share her kitty treasures with local feline lovers, Valerie opened Cat Heaven, her own Cat Gift Shop, at 35 Bright Street Somerset West in December 2017. The response to Cat Heaven has been extremely paw-sitive. Enter Cat Heaven and you are transported to a cat lover’s paradise. 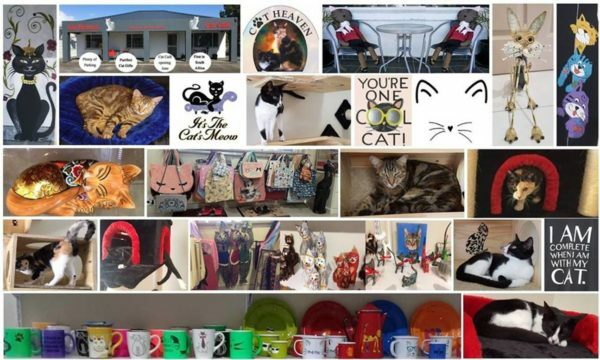 Feast your eyes on a phenomenal array of paw-some gifts including anything from rare collector items to clothing and accessories, jewellery, books, fabric, stationery, toys, ornaments, homeware, chocolates, bumper stickers, mats and many more cat-inspired gifts as well as gifts for cats of course. 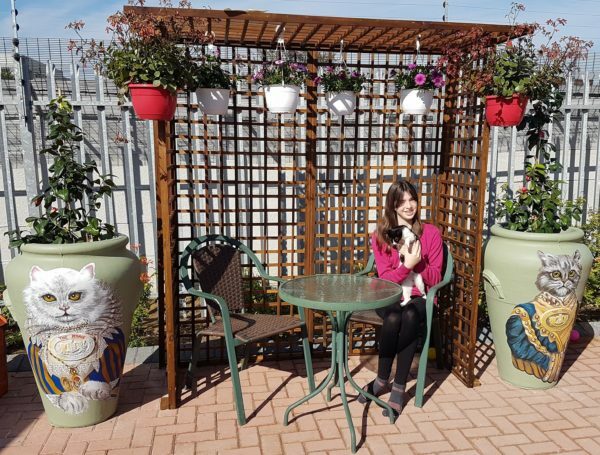 Fulfilling her dream of travelling, shopping and cats, Valerie’s crusade took her to the Cat Cafés of Asia, a craze that has now taken hold around the world: a special place where cat lovers can have a cup of tea while getting their cat fix. “After four visits to Japan, I decided to open my own unique Cat Café back home. Where most Cat Cafés deal with special breeds . . . the beautiful cats, ours is different, aimed at assisting cats in need of a home, a first in South Africa,” says Valerie. Now for the real cat-citement! Cat Heaven’s Rescue Cat Café opened its doors on Friday 1st June 2018. 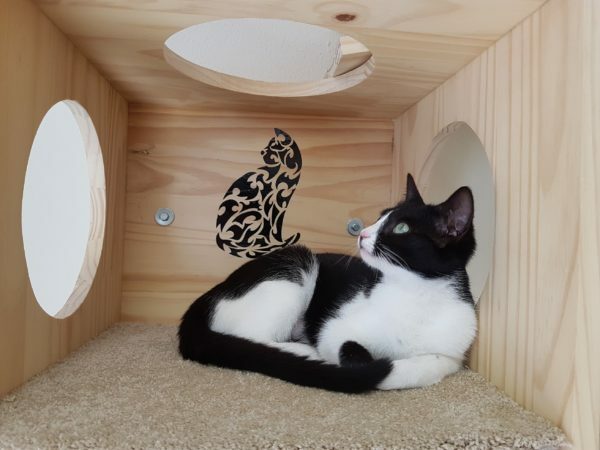 On Monday 21st May twelve adorable cats from Stellenbosch Animal Welfare left their shelter cages behind and moved on to a life of luxury with lots of space and love at Cat Heaven Rescue Cat Café. “I was overcome with excitement and couldn’t wait for my precious rescue kitties to settle down and feel comfortable in their new environment before they and our cat-loving visitors would be able to enjoy each other’s loving company,” continued Valerie. Subsequently three more rescue cats have joined the resident kitties at Cat Heaven, and more will follow soon. Cat Heaven’s kitties have a charming indoor play area filled with a jungle gym, scratching posts, cosy beds, hammocks, mirrors (which they adore) and lots of toys for their amusement, as well as a lovely garden with an outdoor jungle gym and lots of catnip. The indoor café is equipped with a kitty camera, so Valerie and her husband Paul can watch their fur children’s delightful nocturnal antics on the big screen at night. Visitors can indulge in cat cuddles while enjoying a cup of coffee and cookies, reading a book or browsing the web (there is free wi-fi for cat lovers) with a purring cat on their lap. Not everyone has the space, time or wherewithal for a cat of their own and many people, especially senior citizens, live in places where they can’t keep pets, so end up feeling disconnected. 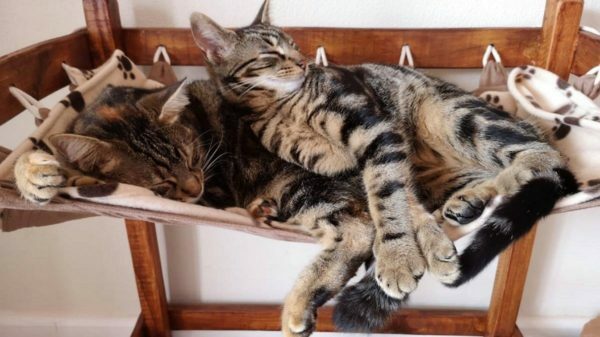 At Cat Heaven they are able to snuggle and pet cats to their hearts’ content and reconnect with the therapeutic wonder that is animal companionship. Cat Heaven’s Rescue Café are offering in-house adoption: an opportunity for cat-loving patrons to become a parent to their very own four-legged child at Cat Heaven, visiting him or her on a regular basis and being kept up to date with their kitty’s comings and goings. “Our Cat Café was built and designed with the happiness and pleasure of our cats as a priority. To ensure our cats are well fed and have access to medical care, we charge an entrance fee along with the sale of coffee, tea, soft drinks, cakes, cookies, biltong, popcorn and Pedal Pops. A local vet conducts monthly medical checks on our cats ensuring that they are vaccinated and treated for fleas and worms. All our cats are micro-chipped, insured, groomed daily and bathed when required. We have a display area with pictures of all our cats on a wall, along with their names to ensure that patrons can get to know them individually. We have a list of very necessary Cat Café rules and a zero-tolerance policy for anyone causing distress to our furry children,” says Valerie who is currently studying Ethology, specialising in cats, and will graduate as a Cat Behaviourist at the end of the year. The Facility Veterinarian for Cat Heaven is Dr Angelique Smit from the Helderberg Animal Hospital in Somerset West. Here are some of her thoughts: “When Valerie Steinmann asked me if I would be the Facility Vet for Cat Heaven, I did not think twice. Cats are just such amazing animals and even Sigmund Freud said: “Time spent with cats is never wasted”. Cats just seem to have such a calming effect on people. I have a particular interest in feline medicine. These kitties are part of our homes and families for up to 18 years (and in some cases even longer). As a Veterinarian, it is a great reward to be playing a small role in ensuring that this special human-animal bond is a long lasting one. I look forward to getting to know the resident cats at Cat Heaven”. Cat Heaven Rescue Cat Café is a non- profit organisation. All funds generated at the Café go towards the feeding and maintenance of the health and welfare of the resident cats, and their environment. Any excess funds are donated to animal charities. “So far fifteen cats have been rescued from Stellenbosch Animal Welfare. There are four ginger and white cats: Major (male) and Coco (female) are brother and sister. Then we have Benji and Sunshine. Sunshine has been given this positive name because of her very ‘sad’ eyes. We have three black and white cats: Gigi (the smallest and friendliest of all the cats), Tutu (with a white collar) and Barack. We have five tabbies. Jolo is the mother of Oz, Prince and Aurora. Then there is Messi who has a knot on the end of his tail (present at birth and not due to any injury). Our latest arrivals are three tortoise-shell cats, Patches, Zaza and Amor. Although outside adoptions are not allowed, Prince was recently adopted by a very good friend of Valerie who fell in love with him. The maximum number of people allowed at any given time is: 6 in the indoor café and 15 in the outdoor café. The entrance fee to the indoor café is R40 per hour and the outdoor café00 per hour. Only coffee, tea, soft drinks and kitty cookies are served. Birthday cakes are permissible by prior arrangement. No children under the age of 6 are allowed. Children under the age of 14 may enter but under the strict supervision of an adult. Cat Heaven’s premises offer ample parking and good security. Please sanitise your hands on entering the Cat Café. Do not pull a cat by its tail, whiskers or any part of its body. Do not attempt to hold or carry a cat. They may sit on your lap if they like you though. Cats do not like loud or sudden music. Talk softly at all times and do not chase the cats. Photographs are welcomed, but no flash photography. Cats’ eyes are very sensitive. Do not wake a sleeping cat or disturb a cat while it is eating. Only food purchased at the Café may be consumed on the premises.